Let your imagination soar. Wish upon a star. Flumpa, the wide-eyed adventurer is going Out of This World with his Earthling friends, Wendy Whitten 'The Singing Scientist' and Rick Florian, in the second release in the multi-award winning science series. Flumpa's World Out of This World is perfect for use in the classroom or home as a launching pad for creativity and discussion on the fascinating subject of space. In the belief that music can teach in ways traditional methods miss, parents will appreciate that the lyrics are factual and the songs are engaging. Teachers and museum curators will be able to supplement their science units and displays and make space come alive through the upbeat music and clever lyrics that will stimulate active learning. Flumpa's World has been applauded by teachers for its curriculum enhancement-light spectrum, planets, astronomy, stars, creative development, observation skills - and by professionals at planetariums, NASA and parks for the awareness it instills about our universe and beyond. Extensive testing of the songs on age appropriate focus groups are used before the product goes to market. This ensures high-quality standards and instills Ion's commitment to excellence. While focusing on fun combined with solid science facts and concepts, Whitten and Florian are determined to open the door of science to a new generation of children. Bound to be a hit with all space fans and explorers Flumpa's World Out of This World will instill wonder and fascination, while encouraging exploration in children and adults. Flumpa's World Out of This World is dedicated to Ray Sloan Whitten (Wendy's father) and to all those who worked on manned and unmanned space missions - past, present and future. Their visions and dreams made what was considered impossible a reality. Hopefully, future generations will have the opportunity to go further into space and uncover more fascinating worlds and discover new technologies that will enhance our scientific knowledge. This is Ion's dream! The musical styles of Flumpa's World: Out of This World travel light years beyond the usual children's fare, with hip-hop, rock & roll and jazz styles intermingling with real scientific information that tantalizes listeners to discover more. The recording also commemorates the 25th anniversary of the docking of Apollo 18 with Soyuz 19 on July 17, 1975, and pays special tribute to the men and women who transformed humankind's extraterrestrial dreams into the reality of space exploration. Flumpa's World: Out of This World is dedicated to Ray Sloan Whitten, father of Flumpa creator Wendy Whitten. Whitten Sr. worked on unmanned and manned missions for NASA, including Mercury, Gemini and Apollo programs. 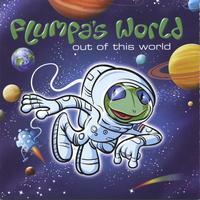 The songs on Flumpa's World: Out of This World present a "mission: possible" where kids find encouragement to follow their dreams, just as early astronomers and space engineers did. From the introductory song "Eyes to the Sky" to tracks like "Razzle Dazzle" and "Anybody Out There?" the message is the same: use your powers of observation and imagination to explore the universe. When kids do the "Flumpa Hop" or spin around the beats of "Planet Swing" and "Earth in Motion," they use their entire bodies in the learning process. The track "Space Challenge" begins with a historic 1961 speech by John F. Kennedy setting the nation on track for space exploration in 1961, plus actual NASA space command recordings, interspersed with dynamic music and lyrics that inspire children to pursue their own adventurous goals. Flumpa's World: Out of This World is the latest in the growing catalog of musical science education products from Ion Imagination Records, a division of Ion Imagination Entertainment, Inc. Flumpa is a lovable rain forest tree frog whose first adventures premiered in the book and tape set The Adventures of Flumpa & Friends, Someday...Someday and the audio recording Flumpa's World: Frogs, Rain Forests & Other Fun Facts. Flumpa is the creation of science educator/performer Wendy Whitten and partner Rick Florian. Wendy's "clear as a mountain stream" voice (Family Fun magazine) and Rick's high-spirited background vocals add to the quality of the productions. Their collaboration aims to bring the world of science to life through solid, entertaining music for children ages 3 to 9. The two are on the road most of the year, along with Flumpa, bringing Flumpa's World to children at schools, museums, zoos, festivals and community centers/parks around the country. "People chuckle at the idea of a frog going into outerspace," says Whitten. "But Flumpa, like all of us, is a wide-eyed adventurer who yearns to learn all he can about his world. What better way to go than up?" Other Flumpa products have won numerous awards and national acclaim. The Adventures of Flumpa and Friends, Someday...Someday received seals of approval from Parents' Choice, the National Parenting Center and Parent Council, Ltd., which applauded "this charming story with bright illustrations." Nashville Parent magazine called The Adventures of Flumpa and Friends " an absolute masterpiece in children's entertainment." Flumpa's World: Frogs, Rain Forests & Other Fun Facts also received awards from Parents' Choice, Parent Council ("outstanding"), the National Parenting Center and Parent's Guide. This rain forest recording was chosen as one of Dr. Toy's 100 Best Products for children in 1998, among many other awards. Ion Imagination Entertainment, Inc., founded in 1994, aims to promote the science and a respect for the Earth through impact entertainment using music, language arts and the visual arts. The company donates a portion of the proceeds from each sale to nonprofit organizations dedicated to the preservation of wildlife and their habitats.